The blue mussel (Lat: Mytilus edulis) is common all around Iceland. It is a medium sized edible bivalve mollusc, which is harvested for food, both wild and farmed. Its habitats are in the North Atlantic ocean between the coasts of North America and Europe, and in temperate polar waters around the world. Its habitat is in shallow, intertidal areas, attached to hard surfaces by byssal threads, secreted by byssal glands in the foot of the mussel. The colours of this mollusc are purple, blue, and sometimes brown. Radial stripes occur occasionally like in the picture. Starfish and dogwhelk eat the blue mussels. 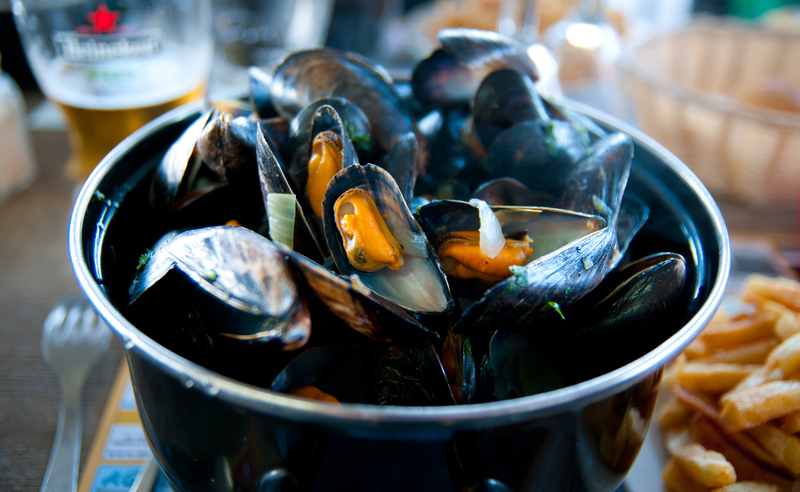 They are used for many seafood dishes in Iceland, Spain, Portugal, France, Italy and other countries. Many Icelanders pick them at high tides all around the country and they are also available at reputable sea food restaurants in iceland.